A small packed size and low weight is essential when backpacking, so you can easily store the bag into a rucksack. Sizes stated are the minimum achieved when the bag is stuffed into its stuffsack and this is compressed as small as possible. Weights stated include the stuffsack. Most of the bags here use a box wall construction, where the down is trapped inside box-shaped baffles within the bag, rather like bricks in a wall. To reduce cold spots, some bags use trapezoid and slanted wall-shaped boxes. To protect the insulation, the shell and lining benefit from some water-resistance, and in some cases this may be enhanced on the base, foot and hood areas. Nylon is often used for the shell and lining, but polyester could be used to reduce prices. The bags featured here all use down insulation. 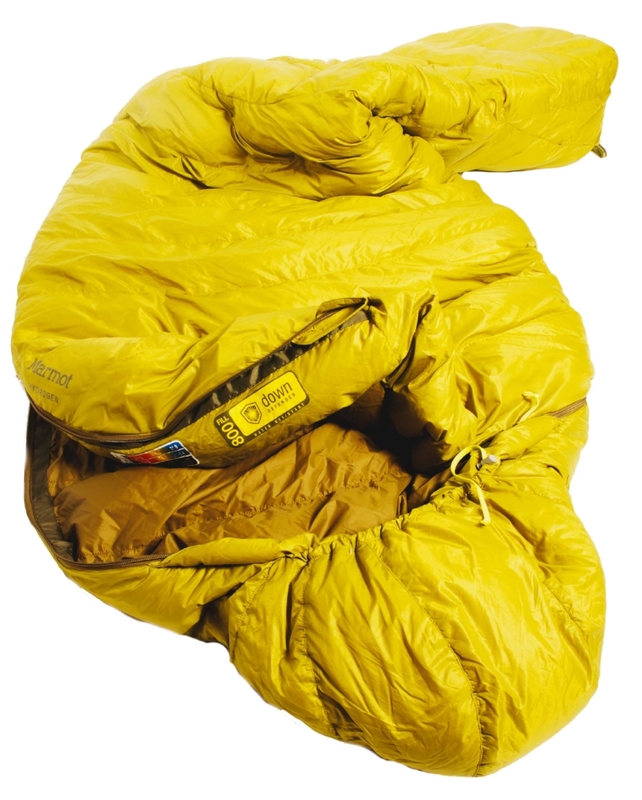 Down has the advantage over synthetic insulation of being more efficient at trapping air, and therefore it can be used to produce lighter and less bulky sleeping bags. It doesn’t maintain its performance when damp very well though, so some manufacturers treat the down (or shell) to help it resist water and dry quicker when damp. If a bag is too big you’ll have more air inside to heat up, and this will tend to move around and escape from the bag. If the bag is too small you’ll be uncomfortable, as you’ll be restricted in movement and the insulation will become compressed so it won’t trap air to keep you warm. Some bags are available in a choice of lengths and there are also women’s models. It is always worth checking with the manufacturer if you need a slightly different size, as there may be size differences available. Sizes stated are for the standard bags. Zip designs vary from half-length to full-length side zips – the former offering a weight saving, the latter making a more versatile bag for hot nights. Zips may come with an anti-snag strip behind them to prevent jamming, or a wide insulation-filled baffle to prevent cold spots along the length of the zip. The fit and degree of insulation in the hood is important in cold conditions. A drawcord will be provided to cinch it in, but some hoods are easier to adjust, making their fit and comfort level better than others. A good shoulder baffle keeps the air down in the bag, which increases its insulating ability. The best can be adjusted to fit closely, while lighter or lower-priced bags may have non-adjustable shoulder baffles, or no shoulder baffle at all. IT'S GOOD What is not to like here? The price is great compared to other down bags, and the weight and packed size are very impressive and more than acceptable for backpacking. The insulation is 750 fill power down and it has even been treated with a Nikwax process so it maintains better performance if it gets slightly damp. The down is held in a box wall construction, and the shell is made from polyester rather than more pricey nylon to help keep costs down. You get a full-length side zip and there is a drawcord around the hood. All of this is great for anyone on a budget wanting a great backpacking bag. HOWEVER The drawbacks are that you are not getting a full shoulder baffle, although it does at least have a front chest baffle that is well padded – so this is only a small negative point. Also the size is slightly smaller than some other bags at 78cm width and 215cm length, so again this depends on your body size. The hood fit is not quite as neat as the best here and the drawcords are not as well baffled for comfort against the head either. If you pay more you get nylon shell materials and even higher performance down for an even lighter bag. So this may not be absolute best performance available, but at this price, does that matter? VERDICT Outstanding value when you compare it to other options, but if you do pay more, you’ll get more benefits. IT'S GOOD What sets this bag apart from every other bag here is its spaciousness. This bag is massive and benefits from a square rather than heavily-tapered footbox area, so you have plenty of room. Also the shoulder width is 89cm and the length is 225cm. The side zip extends around the base of the foot, so you can open this up fully on hot nights. Importantly you also get a good temperature rating and the hood area is well padded. There is also a comfy drawcord around the hood and top of the bag. The shell is polyester and the down is a 700 fill-power. For the price tag, this bag offers a lot of comfort. HOWEVER It is not the lightest option available and it is quite bulky when packed too, so it’s not the best for lighter-weight backpacking. There is no shoulder baffle to lock in the warm air around your body, and as this is a wider and longer bag it will naturally feel cooler than a closer-fitting design, so you tend to need it fully battened down in cooler weather to stay warm. You don’t get the water-resistant down of higher-priced designs, and the outer is made of polyester rather than the more expensive but more durable nylon. The anti-snag zip design is better on some bags. You won’t get this level of space elsewhere but others are lighter. VERDICT A spacious bag for maximum comfort, but the drawbacks are the increased weight and packed size. IT'S GOOD The price is creeping up now but is still far more appealing than the higher-priced options. The insulation is 600 fill power down which is housed in a very robust and tightly-woven polyester, rather than nylon, to reduce costs. You also get an internal shoulder baffle with a drawcord and the hood is well packed with insulation. There is also a drawcord around the top of the bag and around the hood. The side zip extends halfway down the side of the bag, rather than being full length, to save weight, and some reflective piping makes it easier to find the zip at night. The stuffsack contains compression straps. a water-repelling treatment to maintain performance better when it gets damp. VERDICT The price is attractive but the bag is heavier when packed and it has only a half-length side zip, as well as being slightly smaller than some. IT'S GOOD The packed size and weight of this bag are slightly less than some others, and the comfort limit is also a lower offering than normal at -7°C. So what’s going on? Well, the Vulcan uses a V-baffle construction with Hydro-barrier 700 fill power down, which is treated to help maintain performance if damp. There’s also an internal Thermal Reverb aluminised reflective liner within the bag to reflect heat back to the user, while the elastic seams appear to hug the bag closer to the body. These features help give a good temperature rating for the low weight. The bag has a good size, of 220cm long by 80cm wide, and I found all this came together well for a comfy sleep. HOWEVER The hood and foot construction aren’t quite as elaborate as some others, so while these areas work well enough others have more complex designs to better ensure that the insulation is well placed. The hood in particular doesn’t fit as neatly as others. The outer shell is made from ripstop nylon, which is thinner and lighter than other options. This saves weight but does mean you need to treat it with more care. Some bags have added benefits, such as volume adjustment on the hood or a fleecy chin area. The price tag is quite high too, so you need to decide if that low weight is worth it to you. VERDICT Ideal for backpackers wanting to save a few grams, but some details aren’t as good as those on heavier bags. IT'S GOOD The Marmot Hydrogen has an excellent weight for a sleeping bag of this temperature range and at this price tag. But what is really important is that the details are great too. You get 800 fill power down, which carries a Down Defender treatment to reduce the impacts of moisture on its performance. The bag has a Pertex Quantum shell with a side zip that is specially designed to be less likely to snag, and does appear very effective. The hood design fits closer than others and is very comfortable around the face, while the foot box is also well-shaped thanks to some extra panels. It is hard to justify paying more as any improvements gained are small. HOWEVER The bag is slightly narrower than others, being 76cm at the shoulder. It also tends to taper a little more than others toward the feet, but at 220cm the length is good. Also while the hood and top of bag is nicely packed with insulation there is no additional shoulder baffle, so it is necessary to fully tighten down the top of the bag to lock in warmth. To do this there is just one drawcord which goes around the brim of the hood, rather than a cord that extends across the top of the shoulders at the top of the bag. This does work, but others are more adjustable. VERDICT Superb weight for the temperature and price, but personal preferences will dictate if the hood and shoulder design is right for you. IT'S GOOD A well-established bag that has proven itself over a number of years. It has the key features a 3-season camper needs, with a good temperature rating, a good weight and a good packed size. The insulation is 800 fill power down and this is held in place with trapezoidal baffles to limit cold spots at the seams. The shell and lining are made of Pertex Quantum nylon. There is a unique volume adjustment on the back of the hood, so you get a jacket-style hood fit. The baffle is well filled and can be adjusted, while extra panels in the foot allow more space without compressing the insulation. HOWEVER There is not a lot wrong here, but bags with hydrophobic down will maintain a better performance when damp. The bag’s size is 205cm long by 78cm wide, which is slightly shorter and more narrow than some sleeping bags, so some people may feel other bags are more appropriately-sized for them. Some bags are also a degree warmer but for 3-season use this bag is still fine of course. This is not the lowest priced bag available, but if you compare the details it does have a few extra benefits that others lack, such as a microfleece panel around the chin and that great hood and shoulder baffle. VERDICT A great backpacking bag, with the drawbacks being others have more water-resistant down, some are slightly lighter and others are lower in price. 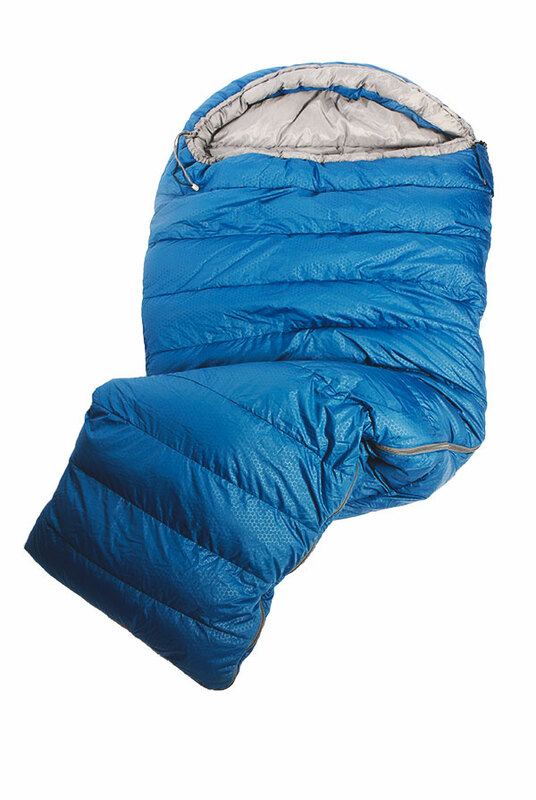 a minimum to save on weight and size, but fundamentally this sleeping bag provides a comfy night’s sleep. HOWEVER With some other bags you get a more water-resistant down and also a more elaborate anti-snag baffle on the zip, so some more care is needed here. I also noticed that some bags have more insulation in the hood, and the drawcord around the hood is less well protected too – so others are more comfortable in the head area in general. There is a shoulder baffle, but some other bags have a more extensive design. Some also have a more elaborate foot box design. At 217cm long and 75cm at the shoulders it is slightly smaller than some. These details may not be important if weight is your main priority, but the price tag may still be a concern. VERDICT An ideal bag for lightweight backpacking, but heavier bags have benefits including a lower price tag. IT'S GOOD The Parsec 20 is new for 2018 and has been designed to be attached to a Thermarest mattress via two removable connectors, which means you are not having to carry a full bag of insulation as the base of the sleeping bag is insulated by being attached to a sleeping mat. It also means you cannot slide off the mat when inside the bag. The bag is insulated with Nikwax-treated 800 fill power down to resist dampness, and a Thermacapture lining traps radiant heat. The half-length side zip has a very good baffle inside, there is a huge shoulder baffle and the hood is very well insulated. The shell is polyester, with a very good water-repellent treatment. HOWEVER This is not quite the lightest and most compact bag, and this is due to not having the thinnest and lightest nylon shell - as well as appearing to have a little more insulation in the hood, the side zip baffle and the shoulder baffle than some other bags. The removable connectors for attaching the bag to the mattress are quite bulky and weigh 40g too, so you could ditch these. Some bags have a shoulder baffle drawcord and also a hood that fits a little neater, with a down-filled baffle under the hood drawcord, so this area isn’t the absolute best. Also that side zip is not full length, so you cannot vent your feet. VERDICT A warm bag with a good weight and attaches to a mattress, but the short side zip may not be ideal. This bag uses 900 fill power down, and appears to have more insulation and be slightly warmer than some other bags at this weight and temperature rating. 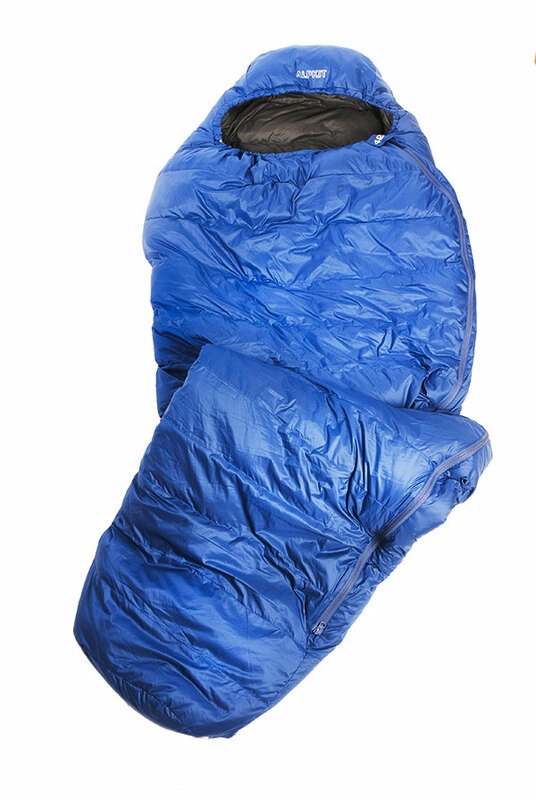 Importantly you also get an exceptionally good weight and small packed size and yet you still get a well-stuffed hood area and a full shoulder baffle, which is better than slightly lighter bags. Slant wall construction is used to reduce cold spots and the shell is made of Pertex Quantum nylon. A nice benefit with this bag is that the side zip is placed on the top edge to reduce cold spots. 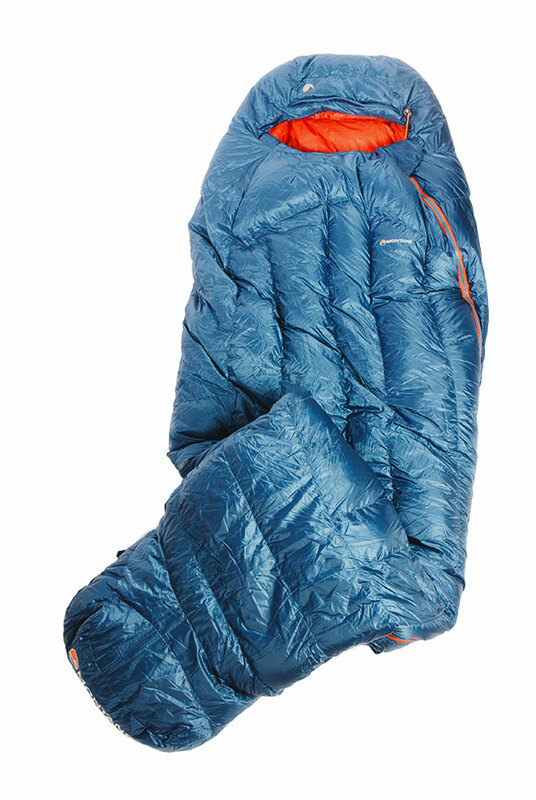 So with its good warmth and minimal packed size this is a winner for backpacking when weight is important. HOWEVER The huge price tag is an obvious issue with this bag, so you need to be keen to warrant the cash. Also this bag’s dimensions are 210cm long by 76cm wide at the shoulder, so it is slightly smaller than some other bags, which taller walkers may need to consider. Yes, you do get a shoulder baffle that is well-filled – but you don’t get a drawcord adjustment, as is standard on heavier bags. Like other lightweight bags the hood drawcord is not as well insulated as others, so it can dig in a little. Also the side zip doesn’t benefit from the elaborate anti-snag strips found elsewhere, so a little more care is needed. VERDICT Exceptionally good weight and warmth for lightweight backpacking, but the price could scupper it.